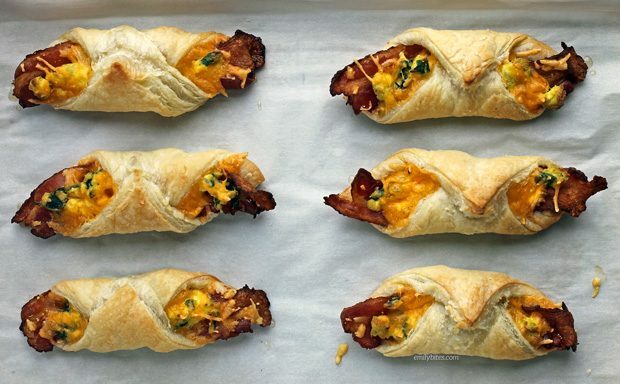 These Bacon Egg and Cheese Breakfast Pastries taste like a fancy meal from a café, but they’re so easy to make at home! 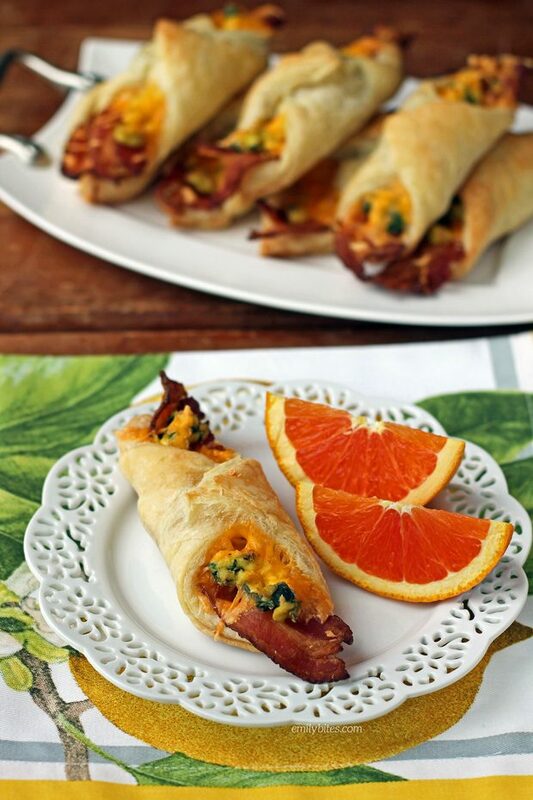 Smoky, crispy bacon, scrambled eggs with spinach and melted cheddar cheese all wrapped up in flaky puff pastry for just 159 calories or 5 Weight Watchers SmartPoints. I think these Bacon Egg and Cheese Breakfast Pastries would be great for a homemade Mother’s Day brunch served with a fresh fruit salad! Looking for more lightened up breakfast favorites? Try my Raspberry Peach Baked Oatmeal Singles, Ham and Cheese Egg Cups, Apple Cinnamon Slow Cooker Oatmeal, Butternut Squash Autumn Frittata, Orange Cranberry Baked Oatmeal Singles, Roasted Grape Cheese Tarts, Maple Bacon Breakfast Wraps, Corn and Zucchini Summer Frittata, Apple Streusel French Toast Muffins, Cheesy Cinnamon Baked Pears, Bubble Up Breakfast Casserole, Blueberry Baked Oatmeal Singles, Ham and Cheese Hash Brown Quiche, Silver Dollar Banana Pancakes, Carrot Cake Doughnuts, Mini Dutch Baby Pancakes, Sausage and Stuffing Brunch Bake, Apple Cinnamon Baked Oatmeal Singles, Lemon Poppy Seed Pancakes, Banana Pancake Bites, Sausage Egg and Cheese Hash Brown Cups, Banana Chocolate Baked Oatmeal Singles and many more in the breakfast section of my recipe index! Cook the bacon according to package directions until almost crisp. Set aside on paper towels to drain. Combine the eggs and water in a bowl and season with salt and pepper. Beat the eggs with a fork until combined. Mist a skillet with cooking spray and bring over medium heat. Add the spinach and cook, stirring, for a minute or two until wilted. Add the beaten eggs and stir to combine with the spinach. Push the eggs around with a spatula as they cook until the eggs are scrambled and cooked. Remove from heat. On a clean, dry surface sprinkle a small amount of flour to prevent sticking and lay down your sheet of defrosted puff pastry. Using a rolling pin, roll the pastry into a 13”x13” square of even thickness. Using a knife or pizza cutter, cut the pastry into 9 even squares (3 rows of 3). Fill a small dish with water and set near your surface. Take each pastry square and turn it to be a diamond with one corner pointing at you. Lay a slice of the cooked bacon on each pastry square from top corner to bottom corner. 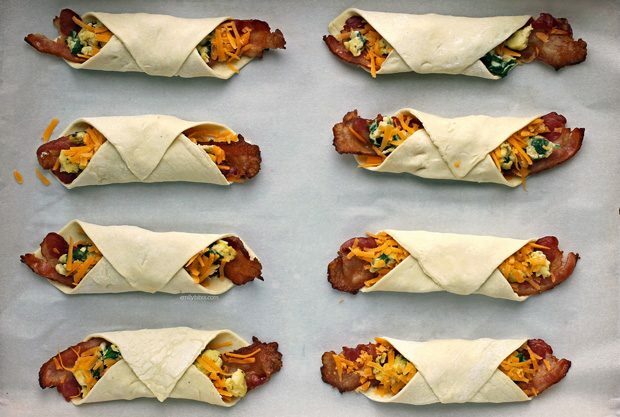 Divide the eggs among the pastries and spread over top of the bacon. Sprinkle the cheddar cheese over the top of the eggs on each pastry. Wet your finger in the water dish and use it to wet the right side corner of a pastry square. Fold the left corner over the ingredients in the center and then fold the (lightly wet) right corner over and press it down to seal. Repeat with the remaining pastry squares. Cover a baking sheet with parchment paper and transfer the pastries to the sheet. Preheat the oven to 400. Place the baking sheet into the freezer or refrigerator for 15-20 minutes to ensure the pastry is chilled (this makes it puff better). Transfer the sheet to the oven and bake for 16-18 minutes until pastry is golden. Hi girl, these look soooo good. How do you cook your center cut bacon to get it so crispy? I usually bake bacon but unless it’s thick cut it tends to burn or else be under cooked. I’m planning to make these next week! Hi, Could you use egg beaters in place of the eggs? Could you use egg beaters instead of eggs? I don’t really egg beaters so I’m not super familiar with the product. I don’t see why not! Probably! I’d freeze them once assembled before baking. These look delicious but I am curious about the calorie count. When I googled the Pepperidge Farm puff pastry the nutritional i puff pastry it said that one of those is 160 calories for just the pastry. I was wondering how the whole thing comes out to be 159 cal? These look delicious. Do you think these are good re-warmed for the next day? I like the idea of cooking these and using them throughout the workweek as a grab and take, or for the kids’ school breakfast, but I don’t want to cook them every day. I made these yesterday for the week. I found that if you wrap it in a damp paper towel and then put in the microwave for about 30 seconds, it worked just fine without drying it out! Thank you for posting these. I have a hard time thinking of breakfast that easy and fun. I can make these for the whole family. @Viv – I made these yesterday for the week. I found that if you wrap it in a damp paper towel and then put in the microwave for about 30 seconds, it worked just fine without drying it out! I made these, the spicy sausage pancake bake and the blueberry cheesecake roll ups for our sunday school breakfast today. I had made the others before but not these. Everyone loved them! I did prep them the night before then baked them right before we left, and that worked out well. Thank you as always for the great recipes. These look delicious. Do you think I could make them and leave them in the freezer until ready to bake or would it be better to bake first then freeze?